Chennai: As classically minded audiences file into Carnatic music concerts these days, a certain section tends to make an immediate beeline for the end seats in the rows—a mysterious decision, since the seats usually have poor sight lines and are situated right beneath gigantic speakers pouring out very loud sound. Matters become clearer when they pull out finger-sized electronic devices, check the battery, press the “Record" button, and extend their arms like boom mikes towards the speakers, a position they will hold with surprising stamina for the next 3 hours. As MP3 recording devices have become smaller and more sensitive, Carnatic music enthusiasts have found them ideal to record the live concerts they attend. In large part, the genre’s heavily improvisational nature itself provides the motive: No two concerts are ever the same, and every concert could potentially be a classic. The city’s annual music season, featuring a chaotic smorgasbord of hundreds of concerts from the middle of December to the second week of January, is thus the amateur recorder’s most golden chance to fatten his music collection by many orders of magnitude. “It’s an unfortunate trend, and I’ve been surprised when even some of my friends don’t seem to accept my stand on it," says Sikkil Gurucharan, a popular young vocalist. “Some people inform us in advance, and if we object, they don’t record. But really, some of these devices are so small that you can never be completely sure." At least in public perception, this practice seems to lie in a grey moral area. 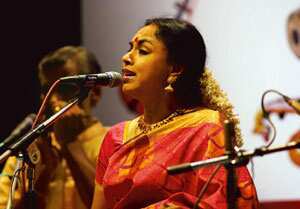 “It is ridiculous to suggest that such an act is unethical and requires the permission of the artiste," wrote one member of the vibrant Carnatic music forum Rasikas.org. “What is not to be done (is to) make an unlawful gain out of such an act." From a purely legal standpoint, however, the recordings are unquestionably illegal. So, artistes or concert organizers are well within their rights when they ask audiences to refrain from using MP3 capture devices, as happens frequently in Carnatic music performances in the US but only rarely in India. “The violation here is of what we call a performer’s right, which is quite distinct from a copyright," says Saikrishna Rajagopal, managing partner at law firm Saikrishna and Associates. “Just the mere act of making this copy of the music, whether for commercial purposes or not, would be considered illegal." The creation and circulation of such recordings is not new. In fact, many music enthusiasts as well as musicians rightly point out that if it were not for taped recordings made at concerts or off All India Radio broadcasts, our musical memories of yesteryear stalwarts such as G.N. Balasubramaniam or M.L. Vasanthakumari would be far poorer. “But in those days, there was no Internet, and not everybody had tape recorders," Gurucharan says. “Now, once you record a concert, there are so many avenues to circulate it." Another key difference lies in the inability, until very recently, to monetize a live concert beyond the sale of tickets at the door. Very few concerts are professionally recorded and released as compact discs; a really active singer may perform 18 times in December, but only one of these concerts will make it to the market as a packaged product. For the other 17, the artistes are paid a flat fee for their performance, and there has traditionally been no other way for them to profit from these live appearances—and therefore, no particular motivation to object to these recordings. “I don’t record concerts, and in principle I am against it," says Vijay Sarma, a veteran of many music seasons in Chennai. “But the problem is, 99% of these concerts are never released commercially. So, I think I am okay with it, as long as the recordings are not shared in any public forum." But in a curious way, just as the Internet has emerged as a scourge for Carnatic music IPR, it may also emerge as a saviour. With new digital download initiatives, record labels can offer a much larger online database of downloadable music than their physical catalogue can ever accommodate. The Charsur Arts Foundation, one such venture, even allows artistes to upload their own recordings of their music, acting as a gateway between musicians and buyers. Suddenly, then, there is an incentive for artistes to record themselves every time they perform, and to control the flow of free but illegal recordings. At a recent performance in Singapore, Gurucharan remembers, the auditorium had a facility to jam mobile phones and prevent them from ringing out in the middle of the concert. “What we really need now," he says wistfully, “is some similar technology that can jam MP3 recorders." This is the first in a series on Chennai’s music season. Next: New media in an old art.